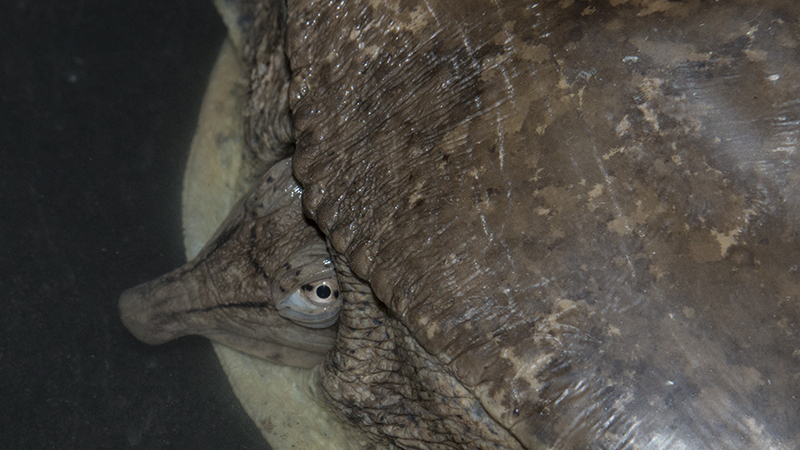 It is time for an announcement blog. 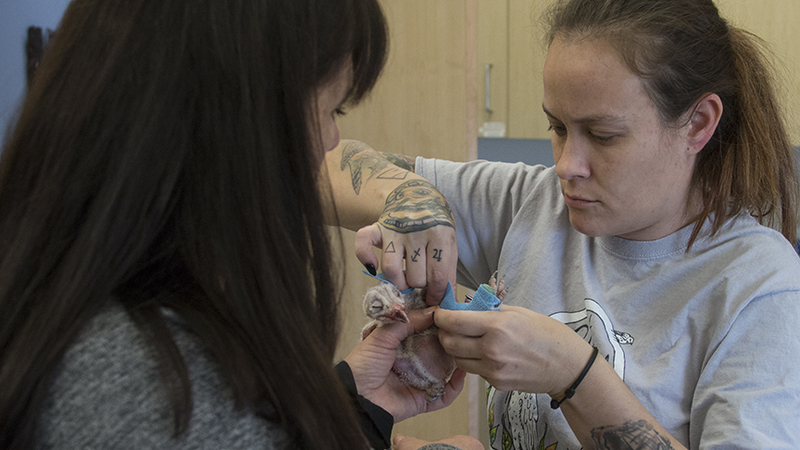 There is so much going on around here beyond the onslaught of intake animals and educational programs that I thought I might take a moment to highlight some of the cool things that are happening at Liberty Wildlife. We have just begun a new endeavor to apply for a grant from Gannett, a modern media company, that supports making communities stronger through their Community Thrives Campaign. Our first goal is to raise $6000 on the CrowdRise platform on line. If we succeed in this first step then we are able to apply to be included in the $1,000,000 grant potential in support of our proposal to make our community stronger. We would greatly appreciate your support of this effort. 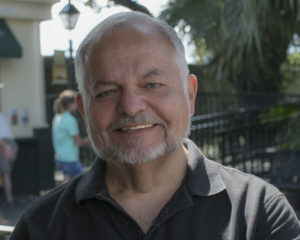 See the link at the end of this blog. On May 4th we have a very happy hour event for you to add to your calendar. We are presenting our Wine and Whiskey with Wildlife event from 4 to 7:00 pm. There will be music, an interesting silent auction, raffles, and other activities to be announced later. Tickets are $50 on line and $55 at the door. At our Arbor Day event, April 27th we have a fun morning planned. Harry Potter themed activities will abound and all of the wishes placed on our Wish Tree will be gathered up and sent to the winds and hopefully they will all granted. Our programming during open hours continues to grow. 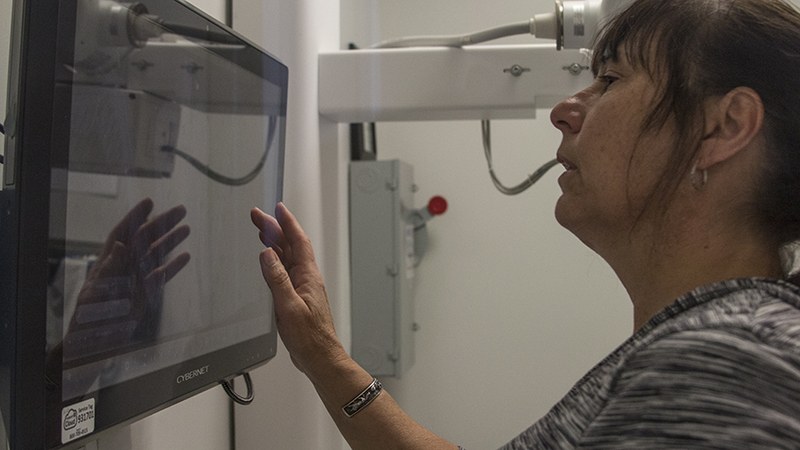 Our tour of the hospital wing includes an educational signage display with the possibility of observing a surgery or triage process. The Interactive Room, and the Interpretative Trail might be enough. But no, we have our up close and personal eagle feeding and raptor presentations with an interlude of greetings by our Indian Runner ducks. Guests are able to interact with Cheese and Quackers… snacks of mealworms are shared and a possible duck/child race to consume mealworms…kids won’t have to eat them like the ducks do… you just have to see it to believe it…very fun indeed and it will make you smile. Another point of interest is the Guardian group. 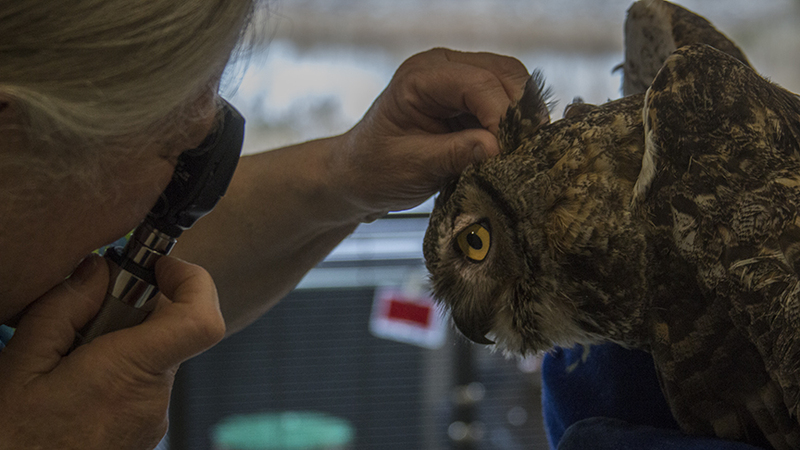 We are adding to that group now as the time for planning for Wishes for Wildlife is upon us. If you have an interest in putting together a great event, now is the time to get involved. Go on line to sign up to make new friends or spend time with old friends. We are organizing in a new, efficient and productive way and look forward to your input.….this is a fun group with a lot of enthusiasm for the mission of Liberty Wildlife. Lastly, at least, for this set of announcements, I am happy to introduce you to Sky Stories, our new series of podcasts based on articles from our NatureNews, an online magazine. ASU Intern, Nathan Thrash is adapting stories by Greg Martin into a podcast format, and they are delightful. Sky Stories is available on three platforms. To listen to it on any device, follow this link:https://anchor.fm/sky-stories. To listen on Apple podcasts, follow this link: https://itunes.apple.com/us/podcast/sky-stories/id1456523801?mt=2&uo=4. To listen on PocketCasts, follow this link: https://pca.st/w1n3. Also, check out Spotify, https://open.spotify.com/show/057mzk4vln3GkXxO2gqNnV Watch for more stories coming your way. 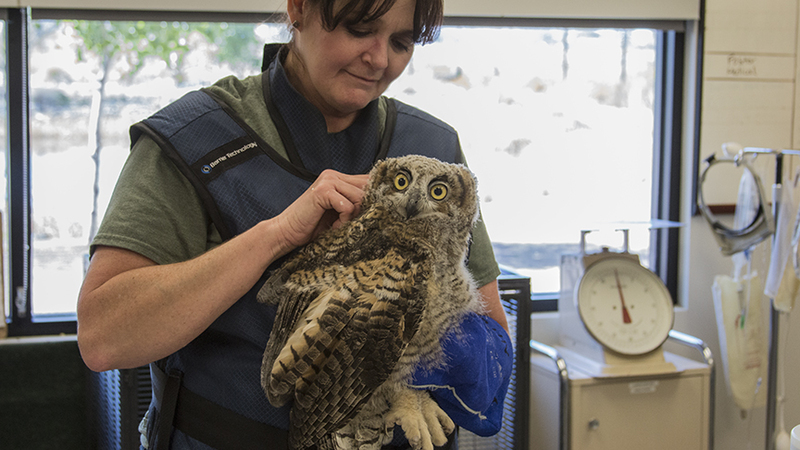 There is always something to do, see or learn at Liberty Wildlife and we are eager to share what we do with all of you. 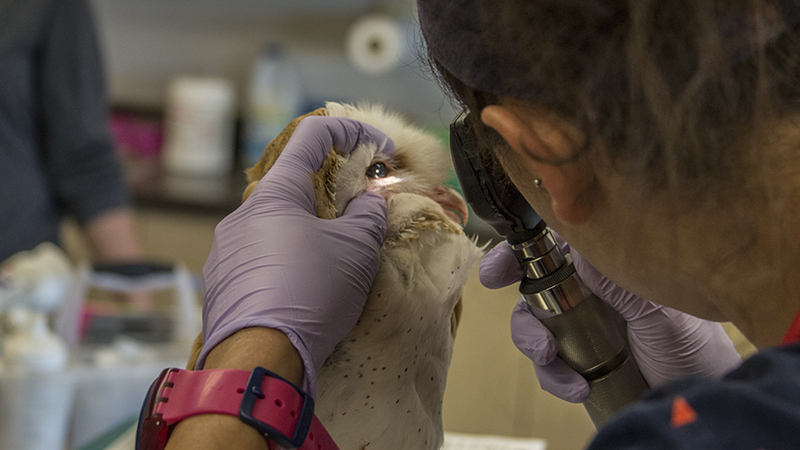 Surely, there is some way for you to be engaged with us to help support the mission of Liberty Wildlife. 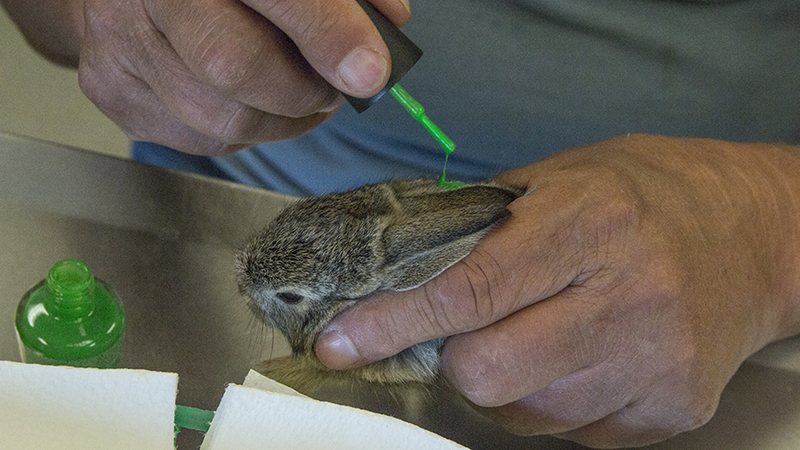 The intake total for the year is now up to 850. Spring is officially here and the intake number is inching upwards. As the temperatures begin their inexorable rise, these will assuredly climb as well. The weather has been mostly benign but when the springtime winds hit, the inevitable spike in orphans blown from their nests will happen. 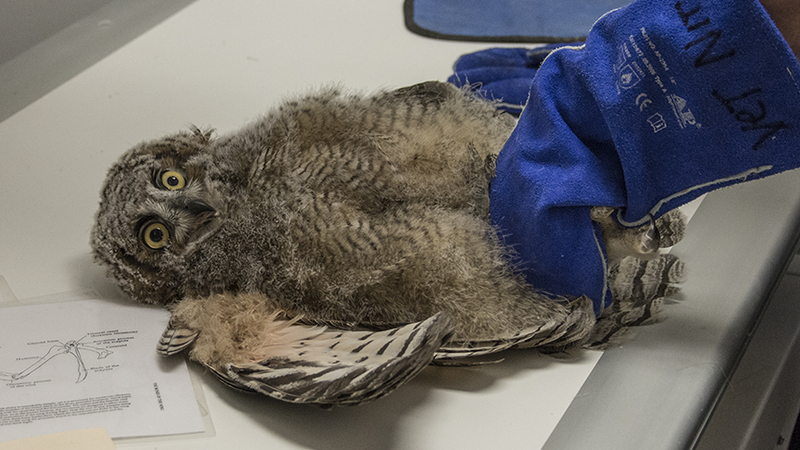 We have already seen a few owl orphans arrive after a couple of windy days recently. 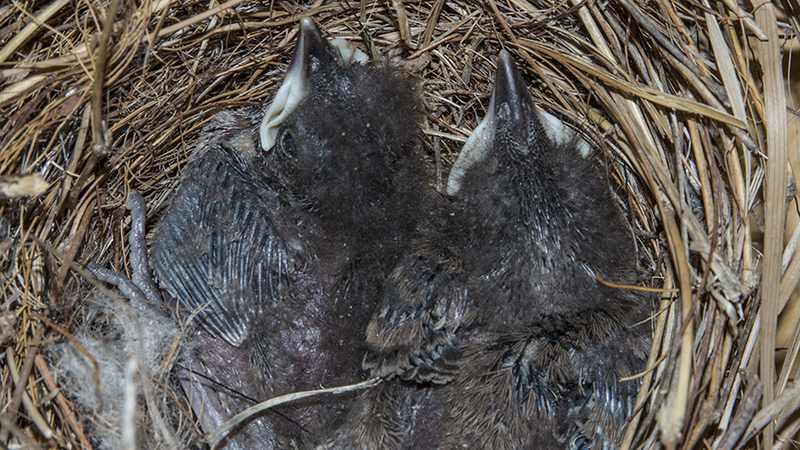 Because their nest ‘departures’ were so premature, injuries resulted from the fall. 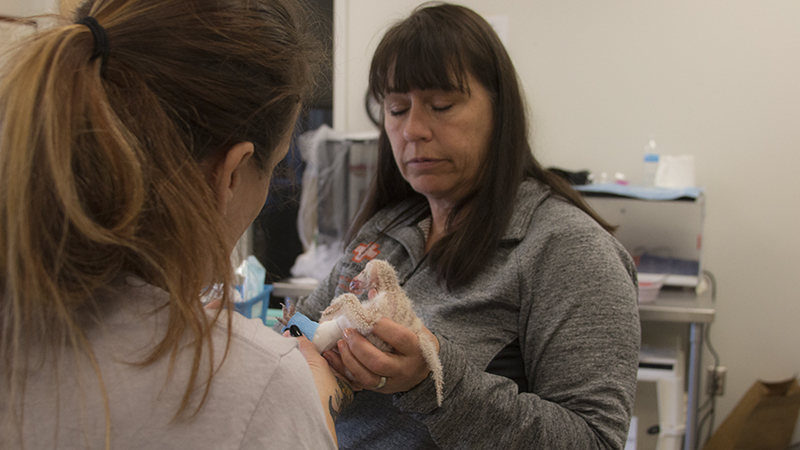 The good news is we have a wonderful staff of vets and techs plus the state-of-the-art hospital at our facility which allows us to immediately offer these little patients top-notch medical treatment. This is, after all, what we do…! His feet seem to work! The wings appear OK as well! 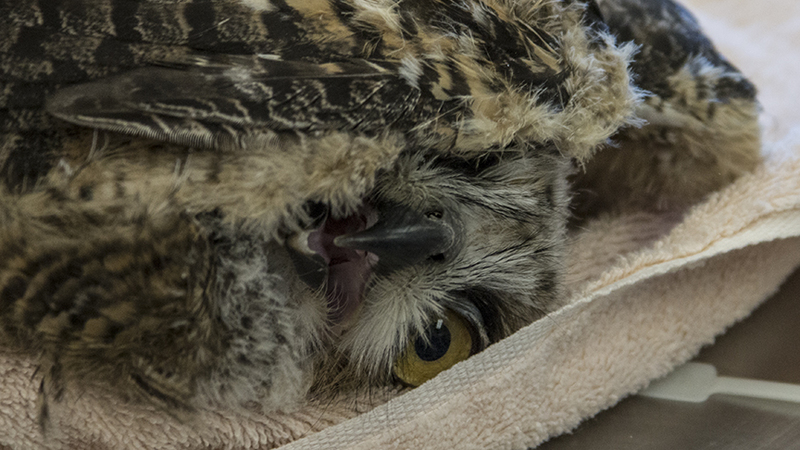 We are still treating the mother GHO that was shot while brooding her young in a palm tree on the west side. 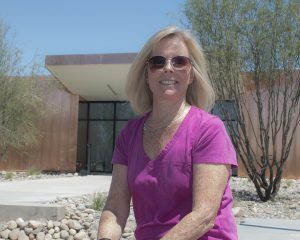 Her condition remains guarded and her vision is still in question. Further updates will follow. 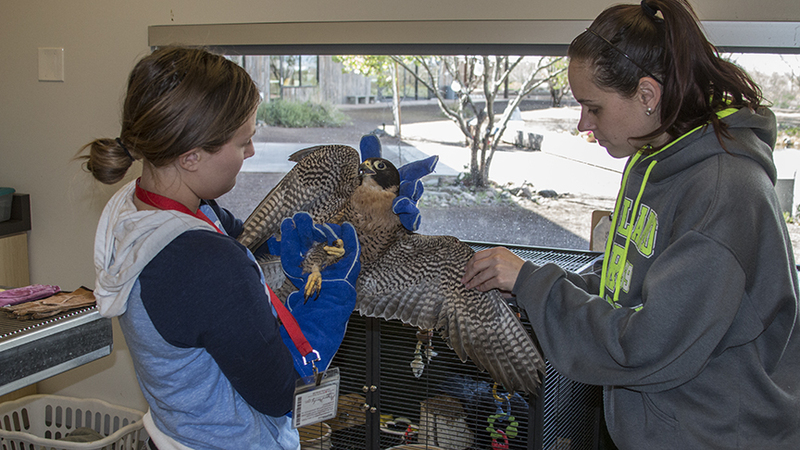 We are also treating a peregrine falcon that was also a gunshot wound. 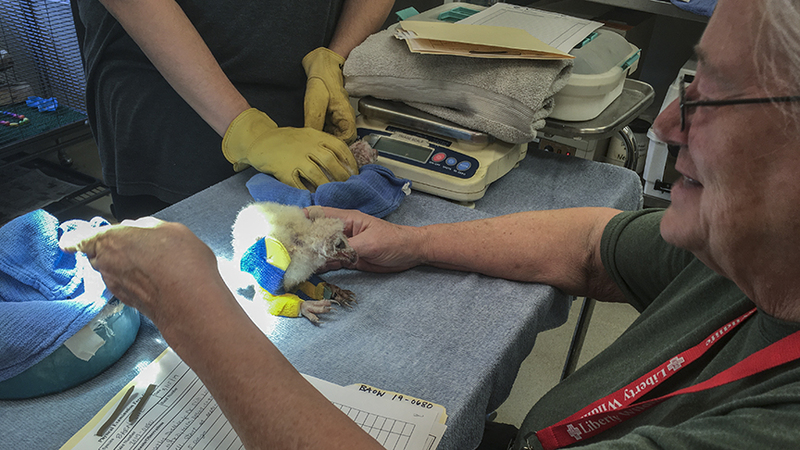 Under the care of Dr. Semick with assistance from Sara, this bird is doing well which is refreshing as we seem to be getting in more than our share of gunshot birds of late. 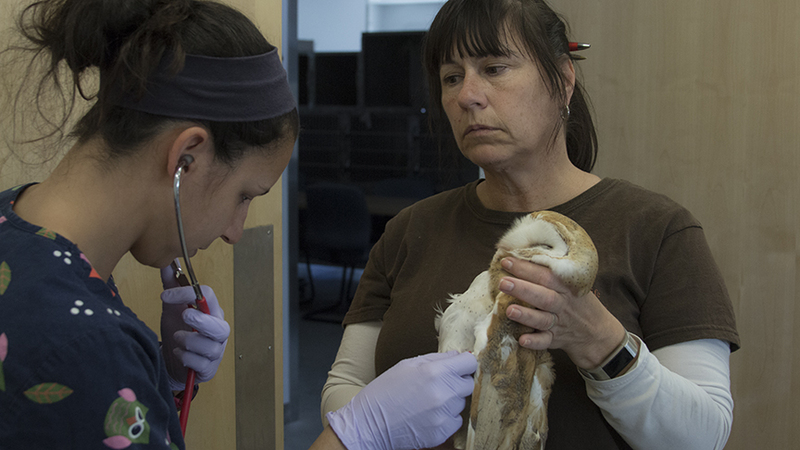 An adult barn owl came in recently and was examined by Dr. Scagnelli on Wednesday. 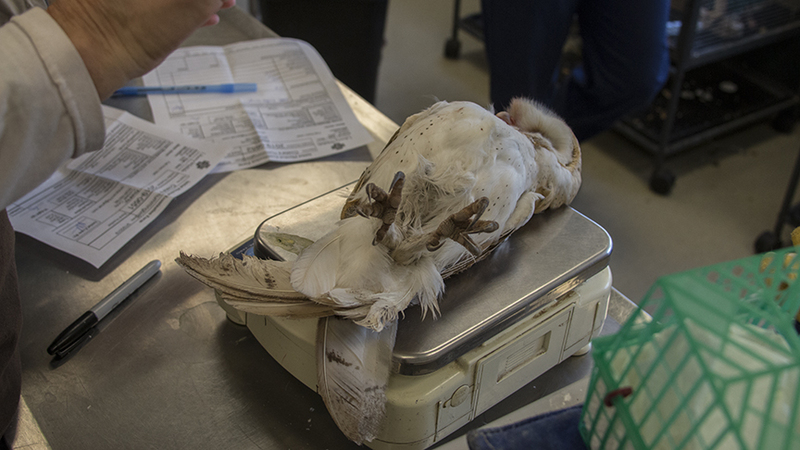 The bird was found on the ground and an X-ray showed he had a possible coracoid fracture. 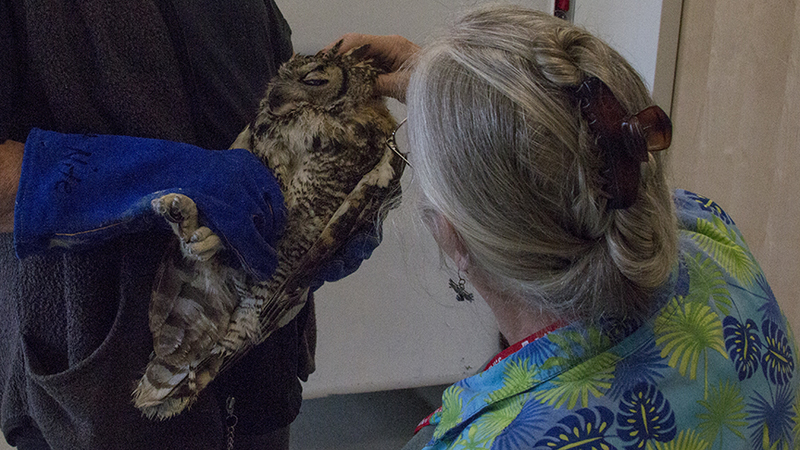 It was not known what caused this injury but it was most likely a collision with something while the bird was in flight. 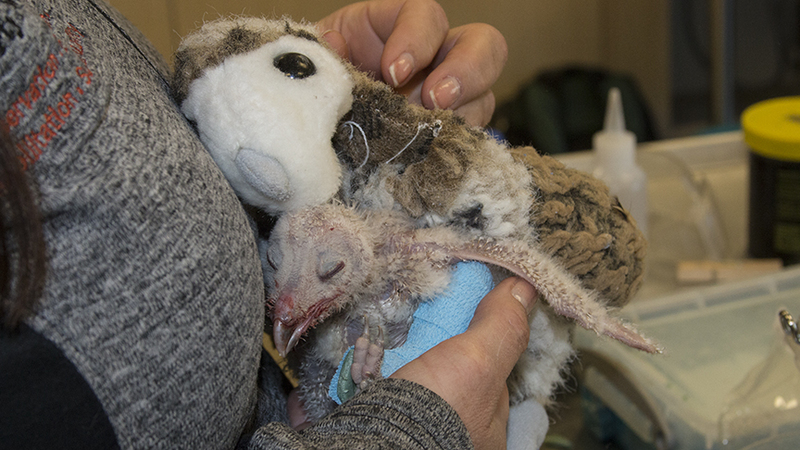 After a period of gusty winds recently, four baby owls, two barn owls and two GHOs were brought in. It was apparent that all four had fallen an appreciable distance as broken limbs were presented by all of them. 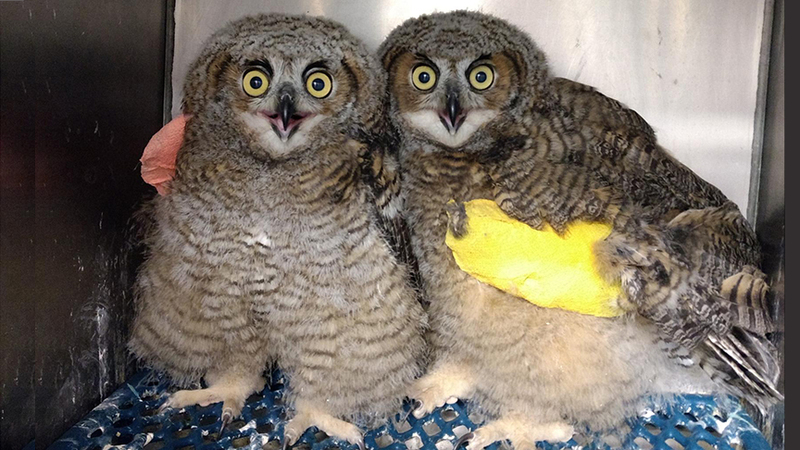 The two great horned babies each had broken wings, having fallen from a great height near the ASU stadium in Tempe. 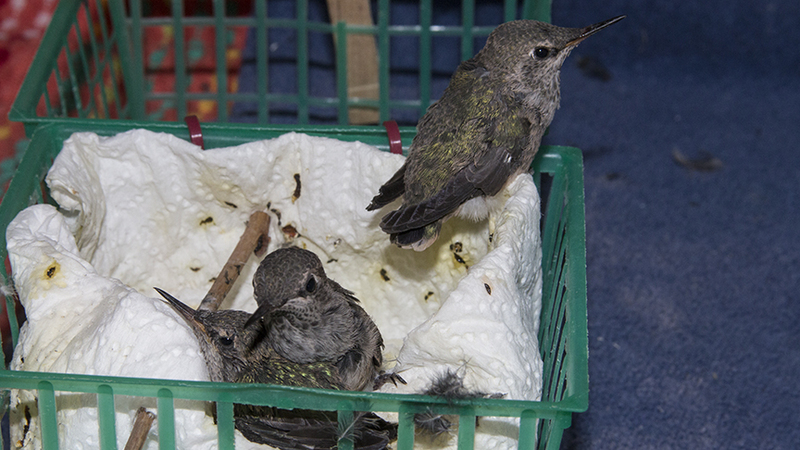 The two siblings, each with a broken wing, are now recovering together in the ICU. 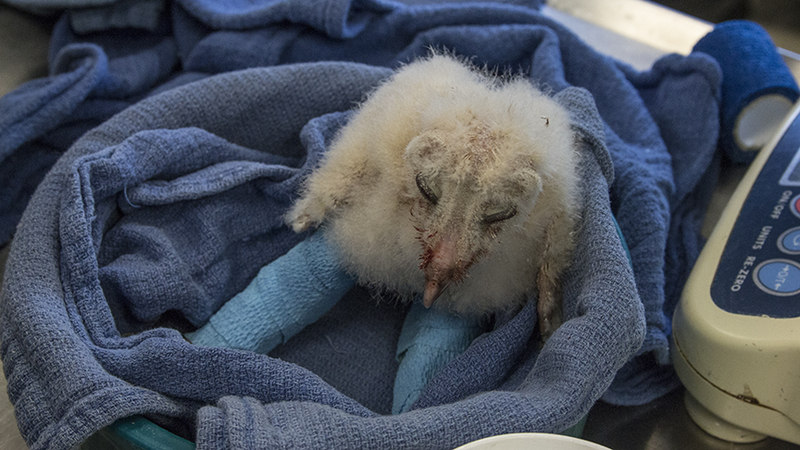 The baby barnies had fractured legs, one having both legs broken. 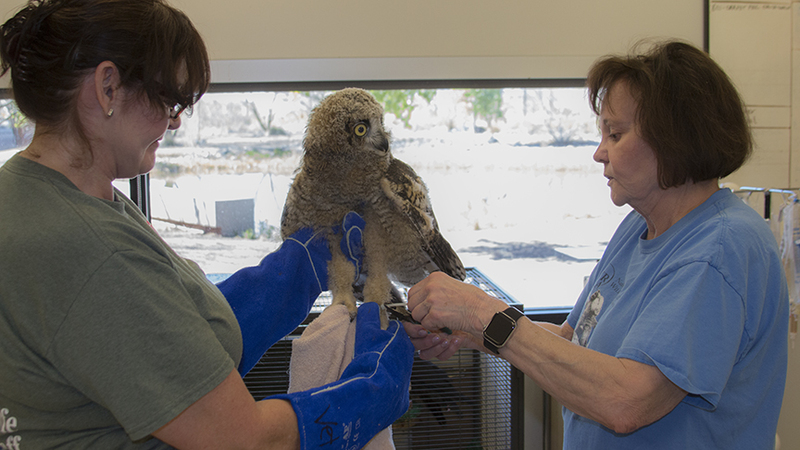 The extraordinary growth rate of baby owls makes splinting broken limbs difficult, but this also helps bones to heal faster – assuming you can keep the ends aligned during the mending process. 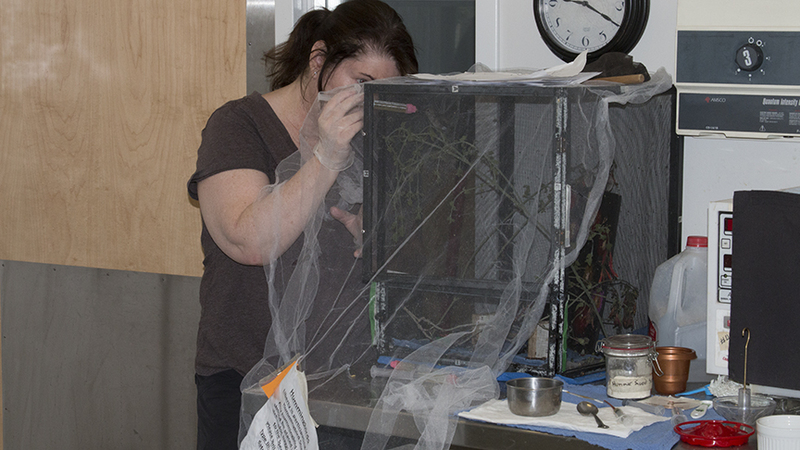 Dr. Orr was on hand to her experienced hands to the wrapping procedures. Ready to join the others! 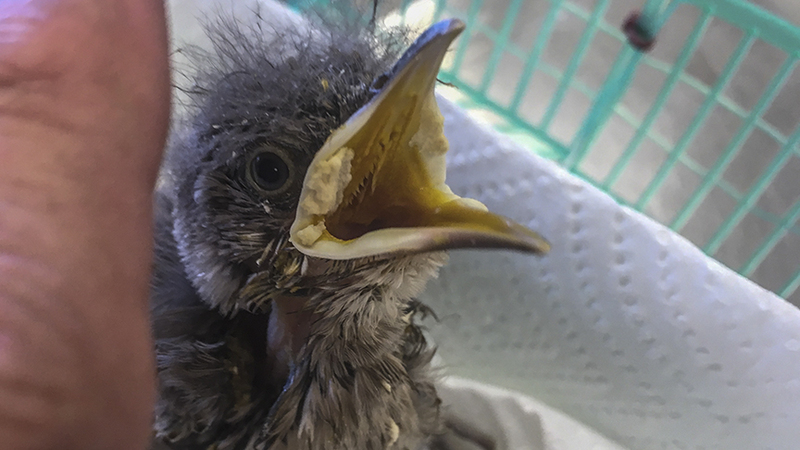 Along with the baby owls, we took in some baby hummingbirds, nestling thrashers, baby cottontails, and a spiny softshell turtle. 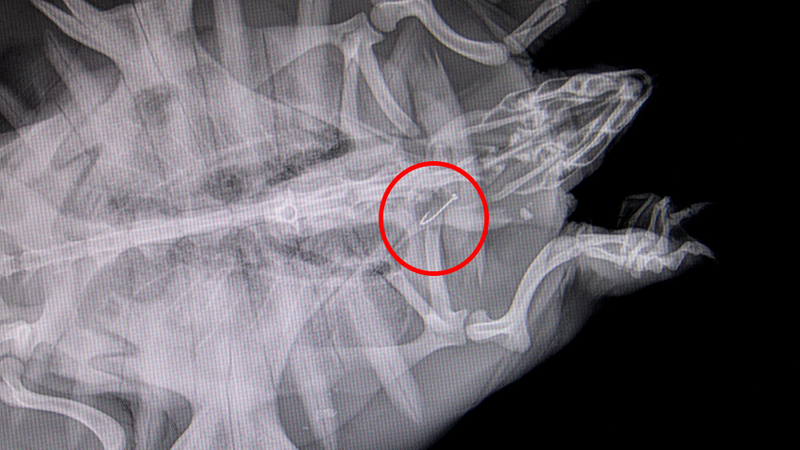 This last specie wasn’t an orphan, but rather another victim of a careless fisherman as X-rays showed he had ingested a fish hook which remains inside him. Hopefully it can be surgically removed allowing him to be released. He’ll be happy to be free again! 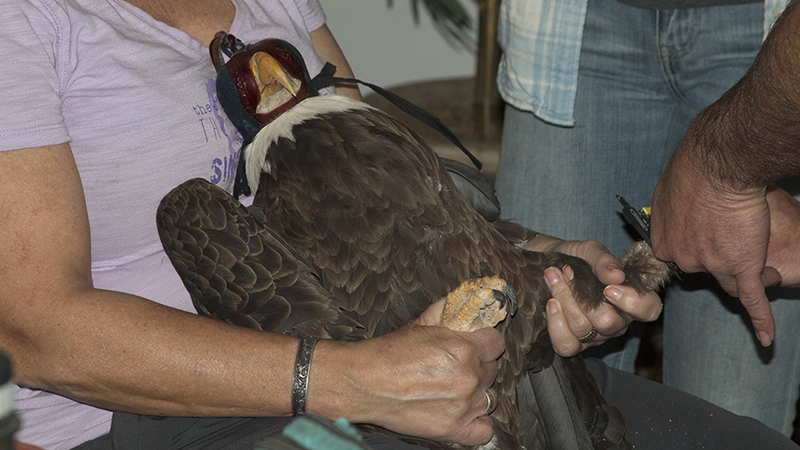 The bald eagle that come in with higher lead levels and insecticide poisoning a few weeks ago has improved markedly. 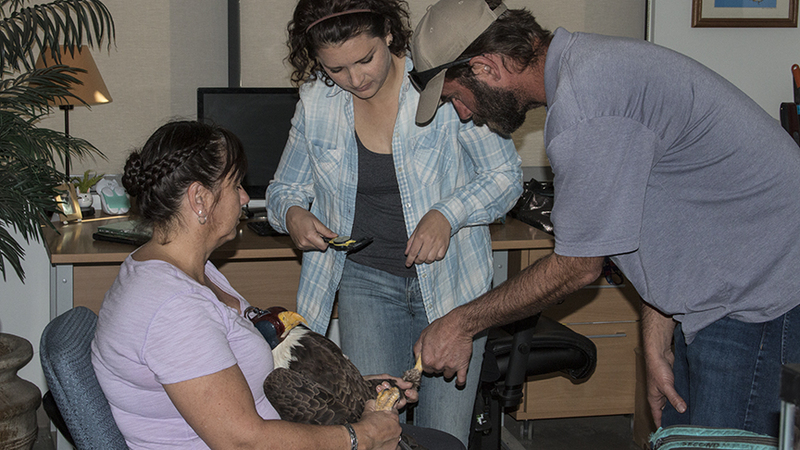 Last week Kyle and Jennifer from AZGFD came down to record his measurements and put identifying bands on him for future tracking. 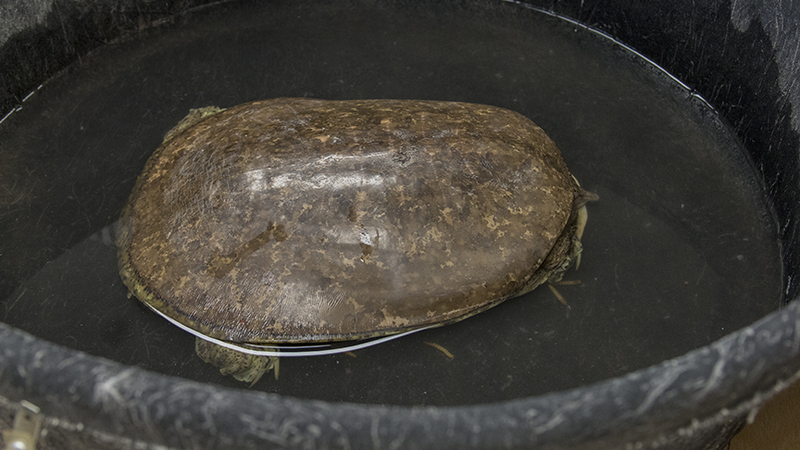 This is all done prior to his release back to the wild. 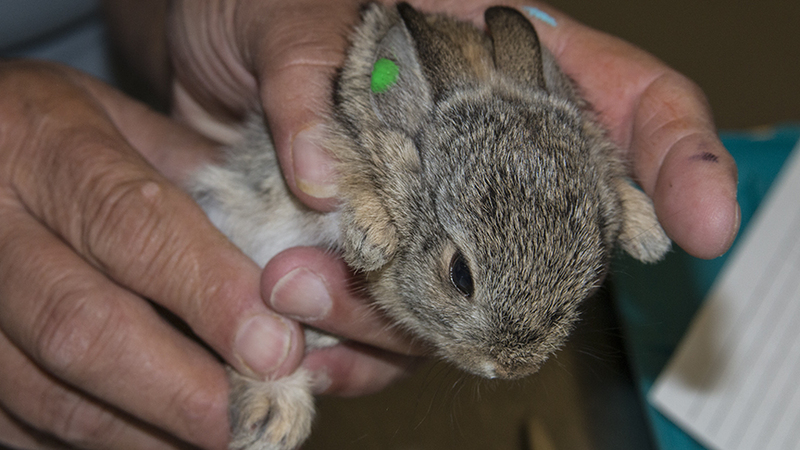 He had been found eating at a landfill up on the rim, presenting behavior consistent with toxic ingestion. 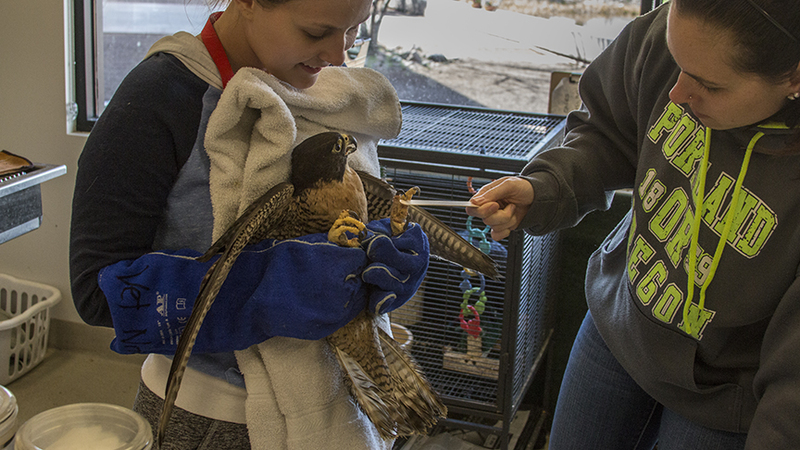 In and around Liberty: Last week Liberty Wildlife hosted a group of students from the Midwestern University College of Veterinary Medicine who attended a class in necropsy. For those unfamiliar with the term, a necropsy is a surgical examination of a dead body, most commonly a dead animal, in order to learn why the animal died. 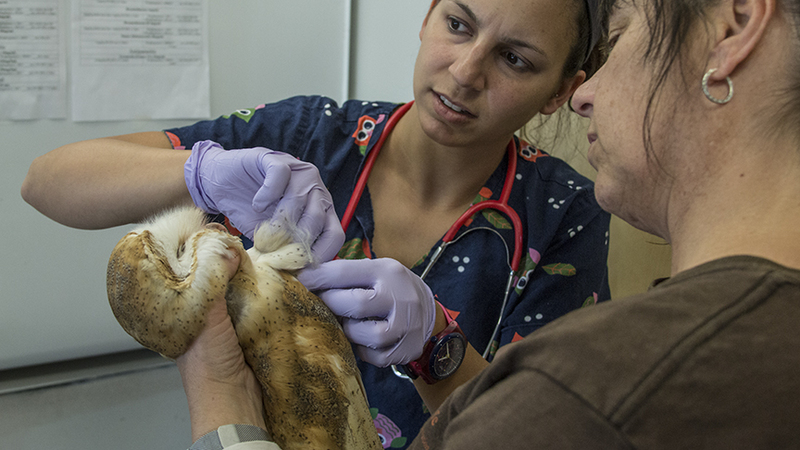 Many of the animals that are treated at Liberty have this procedure done after they die, especially if the circumstances of the animal’s demise are either unknown or suspect in any way. 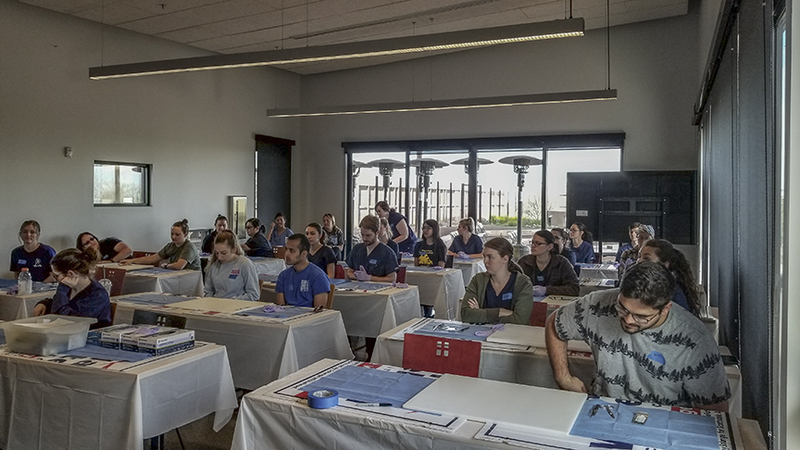 These students got hands on training in this very essential skill in our large classroom facility. 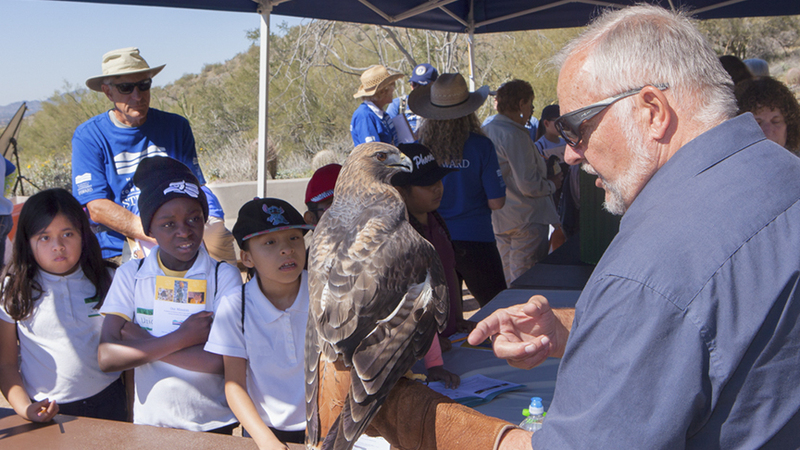 We attended a Junior Citizen Science Festival last week, put on by the McDowell Sonoran Conservancy where several busloads of bright, eager youngsters were allowed to explore the desert north of Scottsdale. The kids went from station to station to view and experience the flora and fauna of the McDowell Mountains and the surrounding ecosystem. 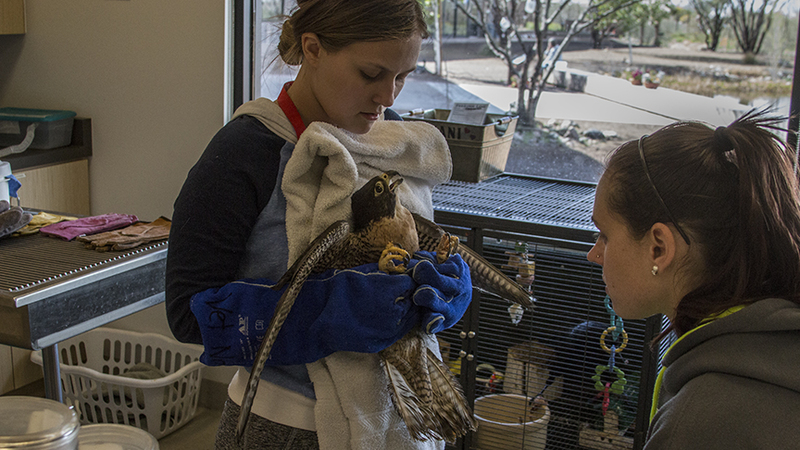 As always, Liberty Wildlife’s birds were a big hit with the kids.